NASA’s Juno spacecraft, that has been orbiting Jupiter since 2016, has sent us back some incredible information. The interior of Jupiter has been a mystery to us since we first started studying Jupiter in the 1600’s, but now we actually have an idea about what Jupiter’s interior is like. 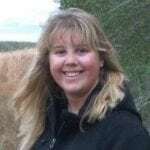 The results of the study were released in the journal Nature (you can read the articles here, here, here, and lastly here). The findings highlight some of Jupiter’s key characteristics, specifically Jupiter’s cloud layers, atmosphere, as well as some speculation about the planet’s core. 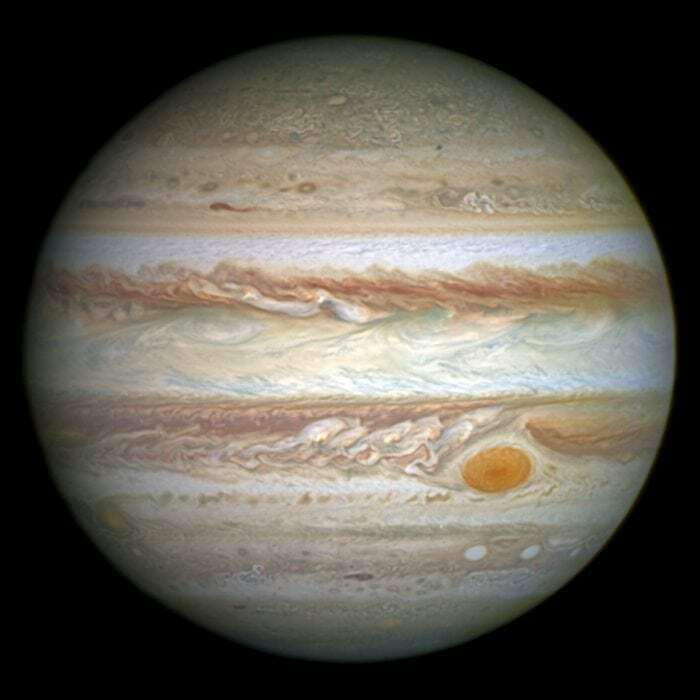 Jupiter is a gas giant, meaning the composition of Jupiter is a mixture of helium and hydrogen and it is not solid. Jupiter is the largest planet in our solar system, coming in at a whopping 86,000 miles wide. What we see when we look at Jupiter is actually cloud covering, including the Great Red spot (found and researched by scientists since the 1600’s) that extend down into the planet over 1,864 miles. Until recently we have had no idea what Jupiter’s center is like since we haven’t been able to look through the cloud layer, but now scientists have a pretty good idea. Since Jupiter is comprised of gases as opposed to a solid like the terrestrial planets (Mercury, Venus, Earth, and Mars) we have speculated whether or not Jupiter’s core would be solid. With the findings gained by Juno, we now have a better idea of what Jupiter’s core is like. Jupiter’s interior is more than likely a liquid that is acting like a solid. The interior consists of liquid hydrogen and helium that rotates, making the liquid to act more like a solid. Another incredible find is how deep the bands on Jupiter go. These bands were first discovered by Galileo over 400 years ago, but we have never really known how deep they are until now. These super strong air currents go as far down as 3,000 km which is roughly 1,870 miles into the planet. These bands actually have affected Jupiter’s gravitational field and they are extremely powerful winds. We are still uncertain about the Great Red Spot, and how deep that goes, but with Juno, we will certainly learn way more about Jupiter and its giant hurricane. So far we have had 8 flyby missions of Jupiter, the earliest being in 1973. Not to play favorites, but quite possibly one of the most important flyby missions was the Voyager mission. The Voyager space probes were launched in 1977 with the purpose of doing flyby missions over Jupiter, Saturn, Uranus, and Neptune, then it would continue on into interstellar space outside of our solar system. The Voyager mission was launched because the gas giants happened to line up for the first time since Thomas Jefferson was president. The mission included 2 probes, Voyager 1 and 2. This was done for redundancy sake just in case 1 probe didn’t make it beyond Jupiter or Saturn. The information that we gathered from the mission rewrote textbooks. We learned: Jupiter had rings similar to Saturn, that there were quite a few hurricanes in Jupiter’s atmosphere, that Io had volcanic activity, that Titan was covered in methane, that Neptune’s dark spot had 1,000 mph winds, and most recently that supersonic winds cease after leaving our solar system. Voyager 1 became the first manmade object to go interstellar in 2012. In 2004, Voyager 1 sent a somewhat garbled message out to NASA, indicating that it was passing through the heliosphere. The heliosphere is the outer limits of our solar system created by the Sun. Think of it like a bubble that the Sun creates (and all large stars for that matter) that define our solar system limits. As you can see in the picture below there is a pretty clear distinction in the different areas of the heliosphere. Another important aspect about Voyager is its golden record. On it is a map of where Earth is, and inside is a record of music and greetings from our planet. The golden record may very well be the only remaining proof of humanity after we die out, so in a way, the golden record (and Voyager) will ensure humanity lives on forever. The record was made with the idea that extraterrestrial life could potentially find it and play it to learn about Earth. Our first orbiter was Galileo, which went into orbit in December of 1995. It studied Jupiter’s moons, a comet named Shoemaker-Levy 9 that struck Jupiter’s atmosphere, and it even had a probe that went into Jupiter’s atmosphere to study it closer. That probe broadcasted information during its descent through Jupiter’s atmosphere before it was crushed by the incredible pressure found on Jupiter. Galileo was officially decommissioned in 2003 when NASA scientists, on purpose, crashed it into Jupiter. 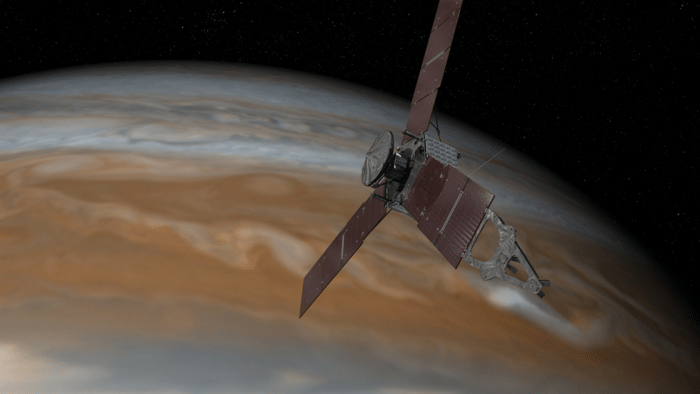 The next orbiter sent was Juno, the same one that has given us the findings of Jupiter’s core and wind speeds. The next planned mission will be Jupiters Icy Moon Explorer (also called JUICE) is scheduled to launch in 2022 where it will do some flybys of the terrestrial planets then make its way to Jupiter by 2030. This will be launched by the European Space Agency and should provide with quite a bit of information about Jupiter and the other planets in our solar system.